Null move - this menu item makes a null move in the current position. A null move is basically making no move therefore giving up the right to move, the opposite side will then be next to play. A null move is illegal in chess play but is very useful in analysis, for example you may play a null move in a variation to illustrate what would happen if the side to play does nothing, thereby showing possible threats of the opponent. Please note a null move can also be played on the chess board simply by moving the king of the side to play onto the opponents king. Null move now has a keyboard short cut of Ctrl+0. 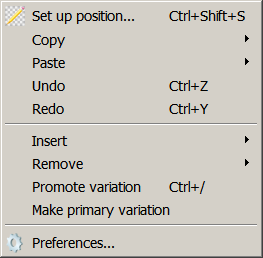 This menu item allows you to open the Preferences dialog where you can configure HIARCS Chess Explorer.